The National Space Symposium will take place April 11 - 14, 2016 in Colorado Springs, Colorado. Today marks the start of the 32nd annual National Space Symposium (NSS), a major international meeting of public and private spaceflight industry leaders. Established by the Space Foundation, a nonprofit that supports public awareness of the space industry as well as industry events, the symposium will take place in Colorado Springs, Colorado, from April 11 to 14. In past years, the meeting has drawn about 9,000 attendees. 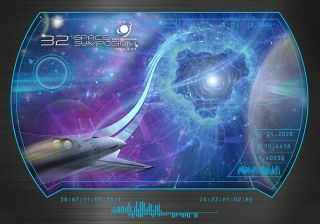 This year's symposium will feature talks by Jeff Bezos, founder and CEO of the spaceflight company Blue Origin; Charles Bolden, administrator for NASA, as well as Dava Newman, the agency's deputy administrator; and Pamela Melroy, deputy director of the tactical technology office at DARPA, the Department of Defense branch that oversees the development of military technology. This year's meeting has an international focus, with sessions centered on the activities of space agencies in Japan, France and Europe, as well as a session on emerging spacefaring nations. The meeting will also feature a session titled "Science!" hosted by TV "Science Guy" Bill Nye, CEO of the Planetary Society. Past NSS meetings have provided an opportunity for spaceflight leaders to discuss current events in the industry. NASA administrators have used the meeting as an opportunity to discuss the agency's current goals and budget situation. Last year, Johann-Dietrich Woerner, head of the European Space Agency, used it as an opportunity to discuss his dedication to establishing a base on the moon.